The purpose of the Coast Guard City program is to recognize the communities that show unusual and extraordinary support to their local Coast Guard units. Through this program, the Coast Guard says thank you to the communities in which it serves. It formally recognizes and rewards them for their continued support. It promotes good will and encourages other cities to develop similar programs and activities. The Coast Guard City program was enacted in 1998 and currently there are only five cities that have obtained this designation nation-wide. 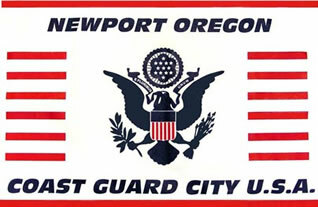 Newport Oregon was recognized as a Coast Guard City on March 28, 2005. The Coast Guard has held a presence in our city for 108 years as of that time. Newport hosts four days of celebrations in which our city recognizes the Coast Guard as an integral part of this community during the Loyalty Days celebration and the Seafaire Festival. There is also an annual spring blessing of the fleet where the Coast Guard is the primary focus, in addition to this our school children enjoy tours of the Station Yaquina Bay and our chamber members are on hand to greet visiting Coast Guard cutters.